This article first appeared in The Edge Financial Daily, on January 2, 2019. KUALA LUMPUR: Malaysia saw a total foreign net outflow of RM11.65 billion or US$2.88 billion last year (excluding Dec 31, 2018 data) — its largest yearly foreign net outflow since 2015 which saw RM19.49 billion of equities pulled out. MIDF Research analyst Adam M Rahim said while this amount already offset total foreign net inflow of RM10.33 billion for 2017, Malaysia still has the second-lowest year-to-date (YTD) outflow among the four Asean markets (including Thailand, the Philippines and Indonesia) that the research firm monitors. He pointed out Thailand recorded the largest foreign net outflow among the four Asean markets. “As of Dec 28, 2018, foreign funds offloaded US$8.91 billion of Thai equities, more than 10 times the amount sold in the preceding year,” he said. This was followed by Indonesia with a total outflow of US$3.66 billion as of Dec 28, 2018, while offshore funds only took out US$3.8 million from the Philippines YTD. 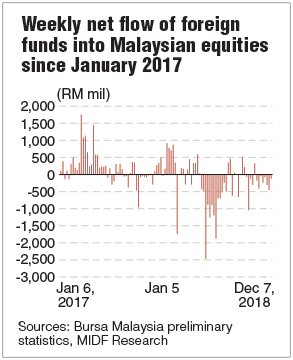 In his weekly fund flow report on Monday, Adam said foreign funds have been selling stocks listed on Bursa Malaysia for the past eight consecutive weeks. “Based on data from Bursa, foreign funds sold RM127.6 million net of local equities for the week ended Dec 28, 2018, the smallest in three weeks,” he said. “[Last] Monday’s foreign net selling declined to RM13 million on the eve of Christmas compared with the previous three trading days which saw foreign net outflow above RM100 million. The slowdown in foreign net selling was partly attributable to Beijing’s pledge to support the economy in the wake of the global trade tribulation by slashing taxes and ensuring liquidity is maintained,” he added. Adam noted that foreign funds later pulled out RM60.6 million on Boxing Day, taking cue from the unnerving political turmoil in the US where US President Donald Trump became hostile towards the US Federal Reserve’s chairman. “This is in conformity with the three other Asean peers that we monitor. “Nonetheless, the level of foreign net selling on [last] Thursday retreated to a lower RM28.1 million amid the overnight jump in Wall Street following a report that US holiday sales hit a six-year high. Meanwhile, the participation rate among various groups of investors saw a decline across the board last week. “The average daily traded value (ADTV) of foreign investors registered the largest weekly drop of 58.7% after declining below RM1 billion to RM475 million. We note the weekly ADTV for foreigners was also the lowest in the last week of 2017,” said Adam. Regionally, MIDF Research noted that foreign funds had taken out US$38.98 billion net worth of equities from the seven Asian markets that it tracks from Jan 1 to Dec 28, 2018, cancelling off the US$21.72 billion net they mopped up in 2017.